The "Black Aces" of VFA-41 operate the F/A-18 Hornet out of NAS Lemoore, CA. Callsign "Fast Eagle", they were established in September 1950 and transitioned from the F-14s in 2002 to their current platform. In August 1981, the Black Aces downed 2 Su-22 "Fitter" fighters after being attacked during an exercise. This is the patch created for their transition from the Tomcat to the Hornet and says "First Step for Big Change". I have some more inbound, but am out at the moment. This cruise patch from 2001/2002 was created as the "First Hornet Cruise / Last Tomcat Cruise" for the VF-41 Black Aces....Awesome patch! The "Black Aces" of VFA-41 now operate the F/A-18F out of NAS Lemoore, CA. Callsign "Fast Eagle", they were established in September 1950 and transitioned from the F-4Ns in April 1976 to their current platform. In August 1981, the Black Aces downed 2 Su-22 "Fitter" fighters after being attacked during an exercise. They participated in several exercises and flew from the decks of several carriers. They also shifted to the USS Lincoln (CVN-72) for 'cleanup' operations at the end of Desert Storm. This is the color version of their squadron patch. 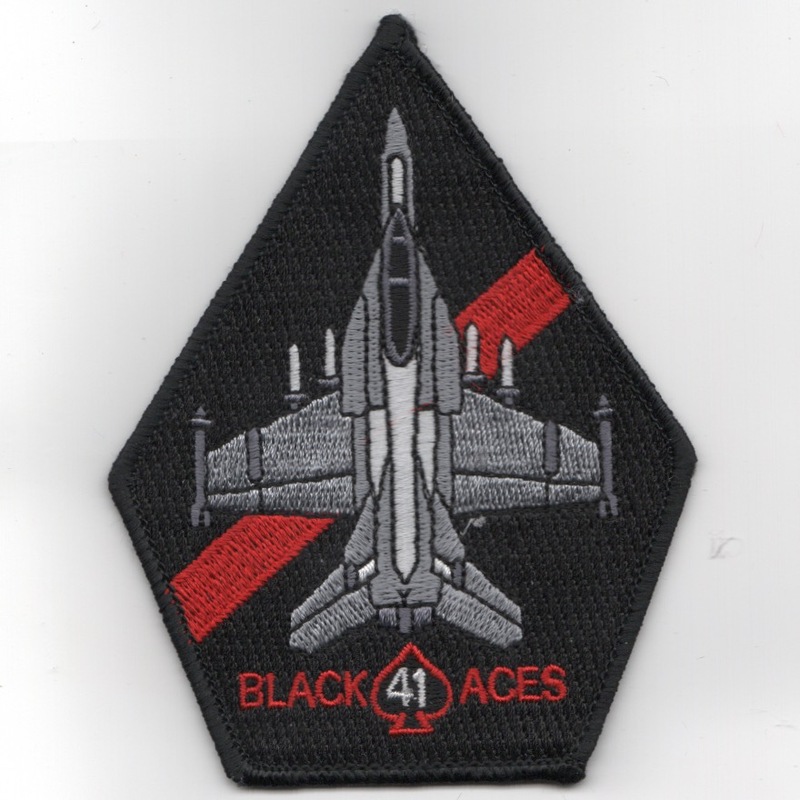 The "Black Aces" of VF-41 now operate the F/A-18F out of NAS Lemoore, CA. Callsign "Fast Eagle", they were established in September 1950 and transitioned from the F-4Ns in April 1976 to their current platform. In August 1981, the Black Aces downed 2 Su-22 "Fitter" fighters after being attacked during an exercise. They participated in several exercises and flew from the decks of several carriers. They also shifted to the USS Lincoln (CVN-72) for 'cleanup' operations at the end of Desert Storm. This is the desert version of their squadron patch. The "Black Aces" of VFA-41 now operate the F/A-18F out of NAS Lemoore, CA. Callsign "Fast Eagle", they were established in September 1950 and transitioned from the F-4Ns in April 1976 to their current platform. In August 1981, the Black Aces downed 2 Su-22 "Fitter" fighters after being attacked during an exercise. They participated in several exercises and flew from the decks of several carriers. They also shifted to the USS Lincoln (CVN-72) for 'cleanup' operations at the end of Desert Storm. 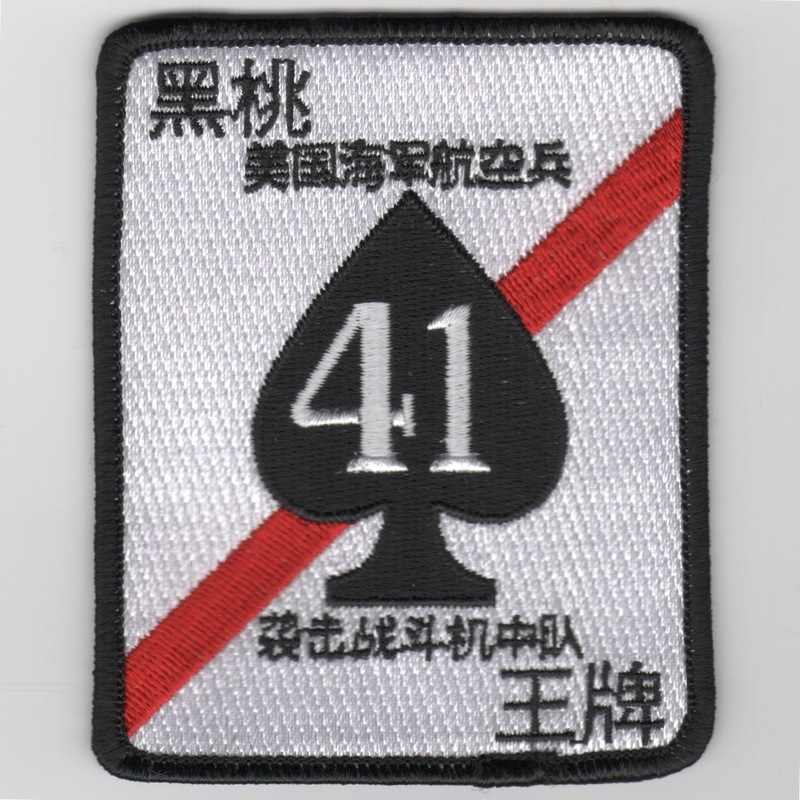 This is the "japanese-script" version of their squadron patch. 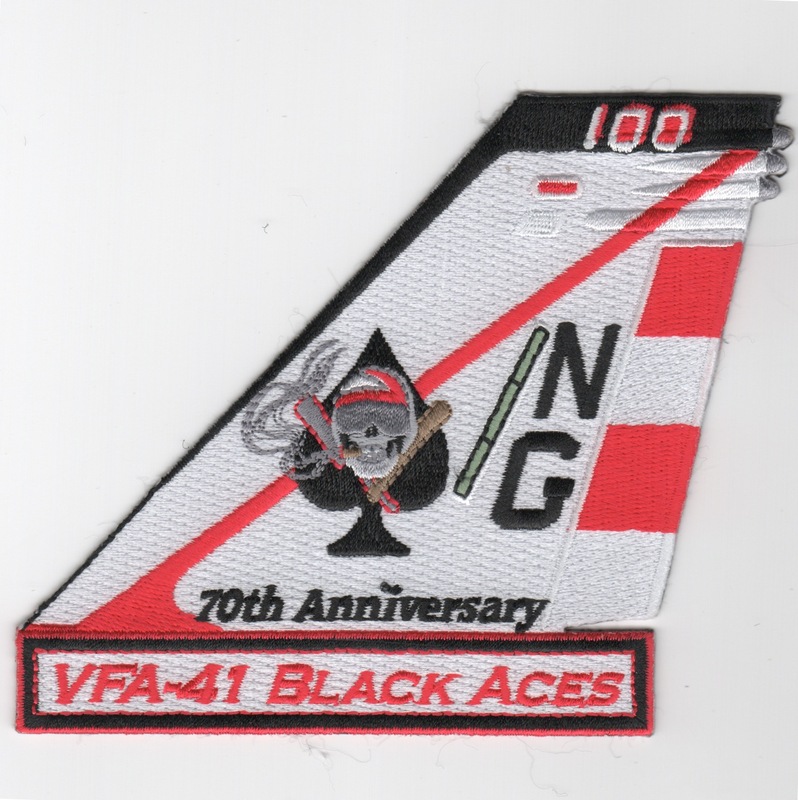 This is the "Friday" patch worn by the "Black Aces" of (then) VF-41. They have since transitioned to the F/A-18 and are now known as the VFA-41 "Black Aces" flying out of NAS Lemoore, CA. This is the red/white 'coffin' patch for the "Black Aces" of VFA-41 that operated the F-14A out of NAS Oceana, VA. Callsign "Fast Eagle", they were established in September 1950 and transitioned from the F-4Ns in April 1976 to their current platform. In August 1981, the Black Aces downed 2 Su-22 "Fitter" fighters after being attacked during an exercise. They participated in several exercises and flew from the decks of several carriers. They also shifted to the USS Lincoln (CVN-72) for 'cleanup' operations at the end of Desert Storm. They currently are with CVW-8 and have transitioned to the F/A-18F Hornet out of NAS Lemoore, CA. This patch does not have velcro attached. 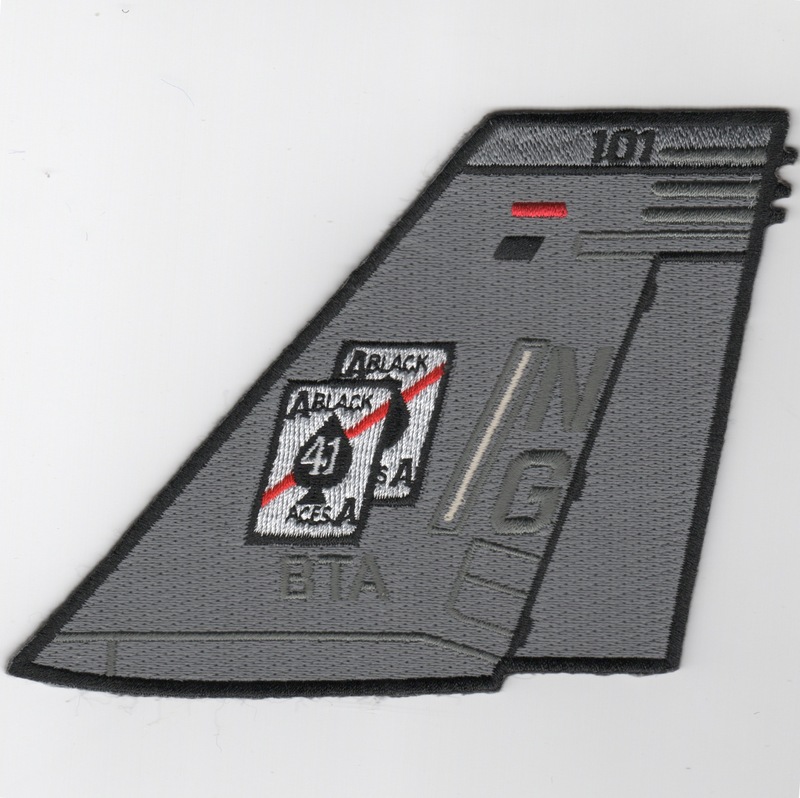 This is the black 'coffin' patch for the "Black Aces" of VFA-41 that operated the F-14A out of NAS Oceana, VA. Callsign "Fast Eagle", they were established in September 1950 and transitioned from the F-4Ns in April 1976 to their current platform. In August 1981, the Black Aces downed 2 Su-22 "Fitter" fighters after being attacked during an exercise. They participated in several exercises and flew from the decks of several carriers. They also shifted to the USS Lincoln (CVN-72) for 'cleanup' operations at the end of Desert Storm. They currently are with CVW-8 and have transitioned to the F/A-18F Hornet out of NAS Lemoore, CA. This patch does not have velcro attached. 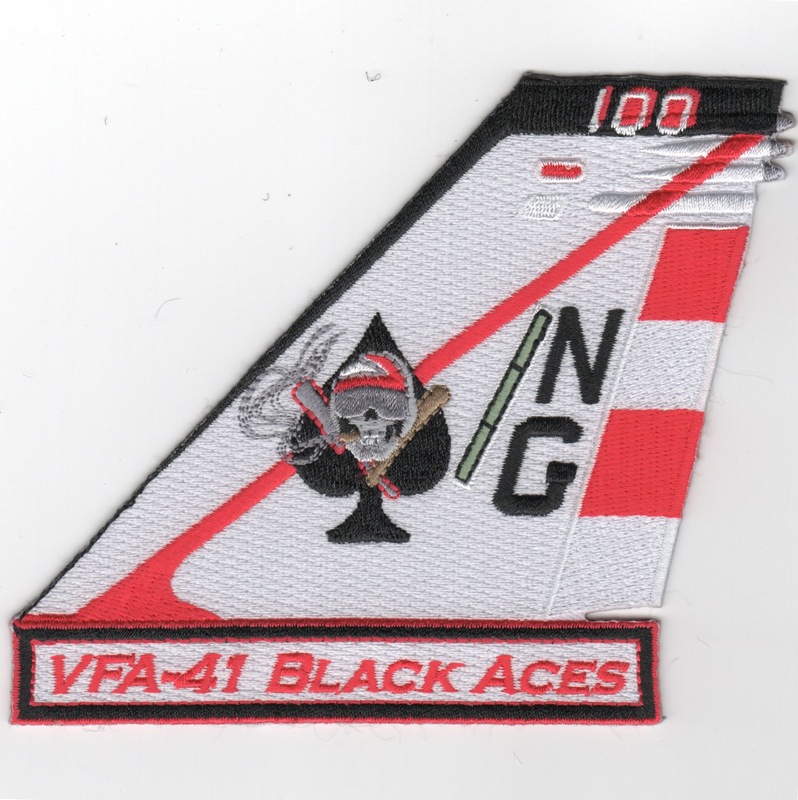 This is the aircraft triangle patch for the "Black Aces" of VFA-41 that operated the F-14A out of NAS Oceana, VA. Callsign "Fast Eagle", they were established in September 1950 and transitioned from the F-4Ns in April 1976 to their current platform. In August 1981, the Black Aces downed 2 Su-22 "Fitter" fighters after being attacked during an exercise. They participated in several exercises and flew from the decks of several carriers. They also shifted to the USS Lincoln (CVN-72) for 'cleanup' operations at the end of Desert Storm. They currently are with CVW-8 and have transitioned to the F/A-18F Hornet out of NAS Lemoore, CA. 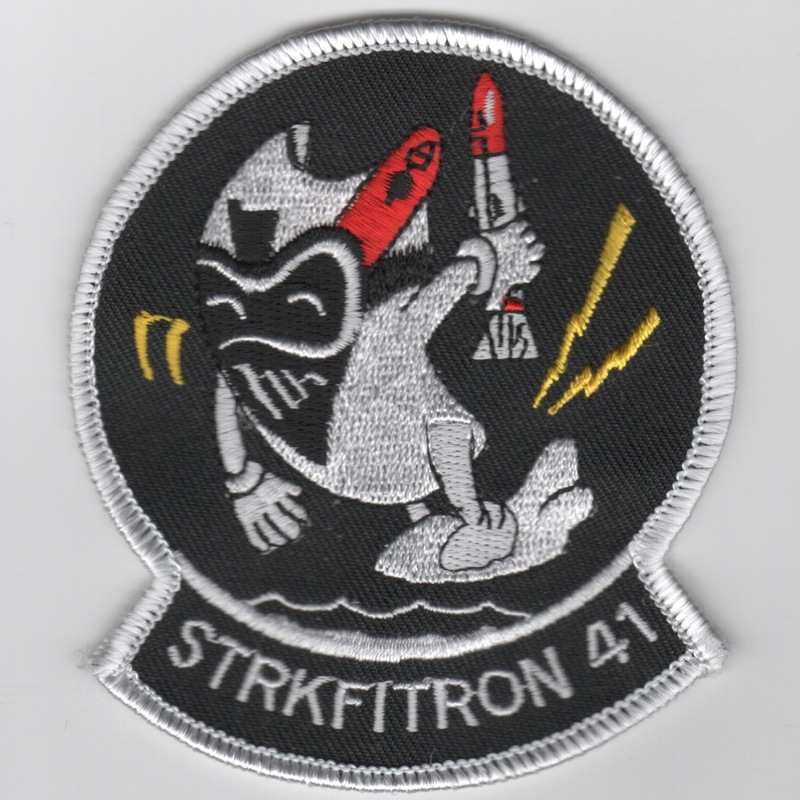 This is the "felix-shaped" patch created by the Black Aces that says "STRKFITRON 41" along the bottom and depicts their "Ace of Spades" mascot getting a missile ready to launch. This patch does not come with velcro attached. 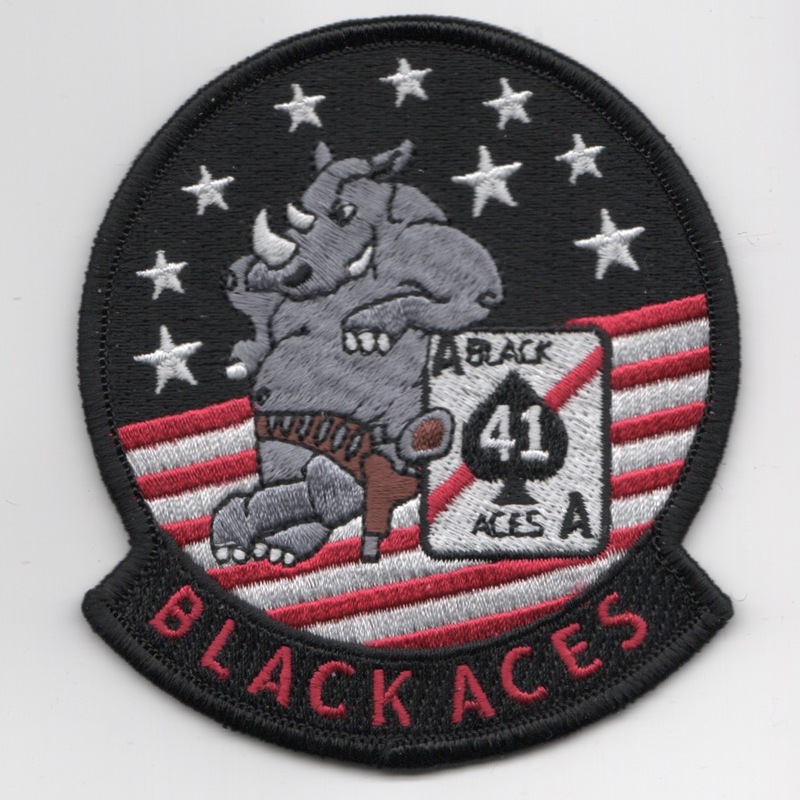 This is the "felix-shaped" patch created by the Black Aces that says "BLACK ACES" along the bottom and depicts the F-18 "RHINO" mascot leaning against the squadron logo, the Ace of Spades. It's a homage to their lineage aircraft, the F-14 Tomcat. This patch does not come with velcro attached. 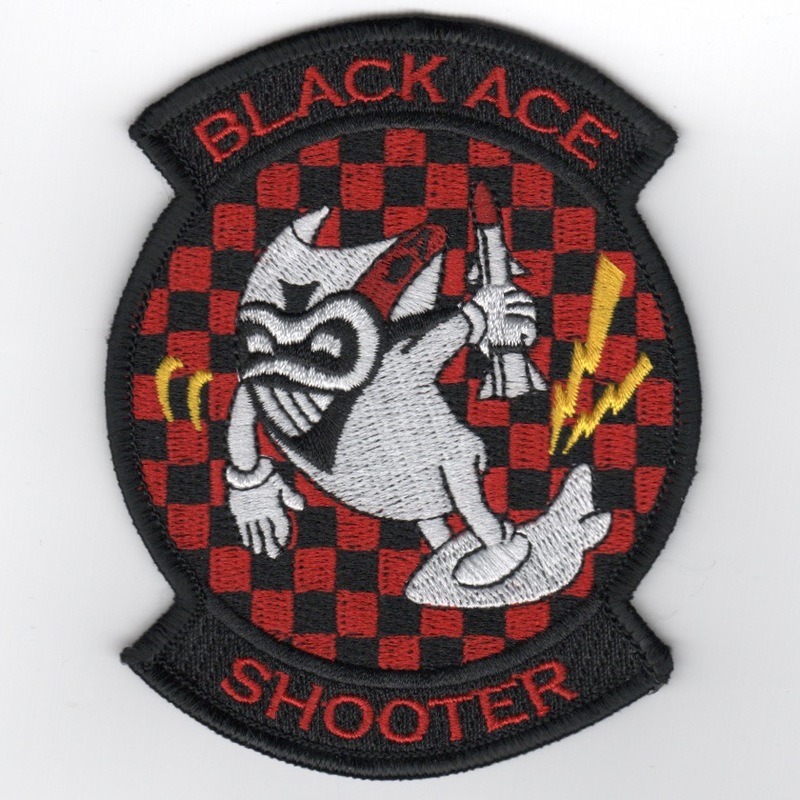 Another AV8RSTUFF Creation: This is the "SHOOTER" patch created by the Black Aces 'troubleshooters' that says "BLACK ACE" along the top and "SHOOTER" along the bottom, and depicts their "Ace of Spades" mascot getting a missile ready to launch. This patch does not come with velcro attached. The "Black Aces" of VFA-41 now operate the F/A-18F out of NAS Lemoore, CA. Callsign "Fast Eagle", they were established in September 1950 and transitioned from the F-4Ns in April 1976 to their current platform. This is the white version of their F/A-18F TAILFIN patch. The "Black Aces" of VFA-41 now operate the F/A-18F out of NAS Lemoore, CA. Callsign "Fast Eagle", they were established in September 1950 and transitioned from the F-4Ns in April 1976 to their current platform. This is the 70th Anniversary version of their F/A-18F TAILFIN patch. The "Black Aces" of VFA-41 now operate the F/A-18F out of NAS Lemoore, CA. Callsign "Fast Eagle", they were established in September 1950 and transitioned from the F-4Ns in April 1976 to their current platform. This is the gray version of their F/A-18F TAILFIN patch and says "BTG" below the squadron logo (not sure why). Another AV8RSTUFF Creation: The "Black Aces" of VFA-41 now operate the F/A-18F out of NAS Lemoore, CA. Callsign "Fast Eagle", they were established in September 1950 and transitioned from the F-4Ns in April 1976 to their current platform. 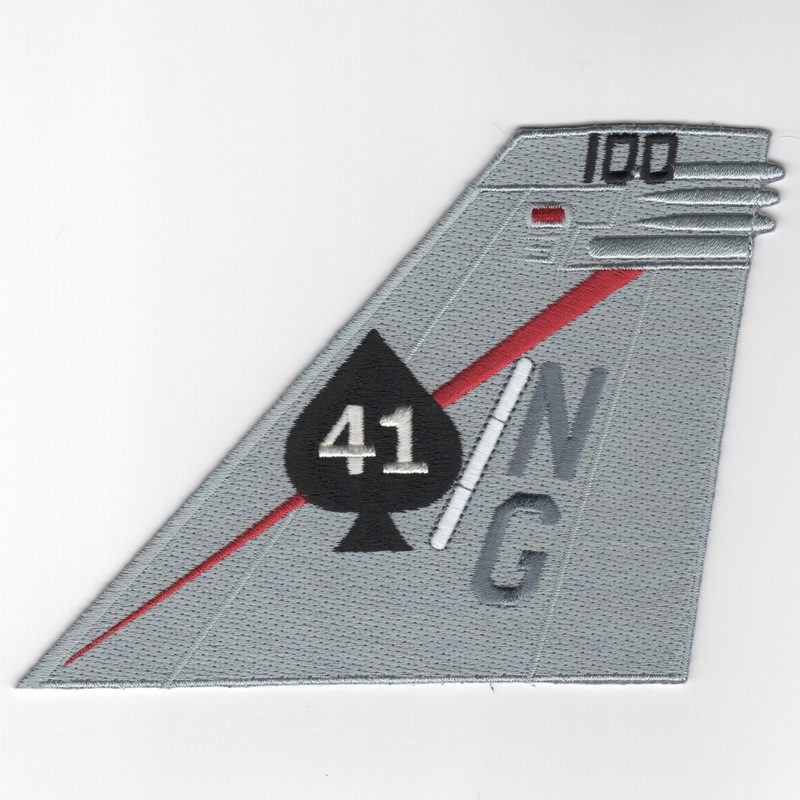 This is the gray version of their F/A-18F TAILFIN patch and says "NG" below the squadron logo. 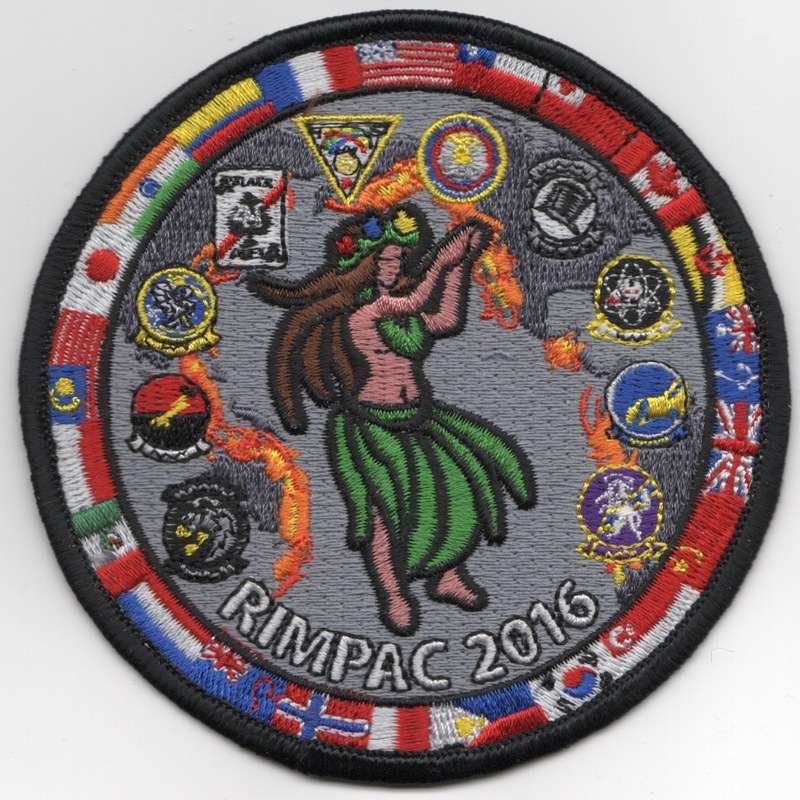 (Obtained from their supplier): This is one of the "joint endeavor" patches created by both VFA-14 Tophatters and VFA-41 Black Aces for their 2016 "RIMPAC" cruise. It shows a "HULA" girl dancing across the Pacific Rim countries, has the logos of all the squadrons in the Airwing, and the flags of the countries that line the "PACIFIC RIM". This patch does not come with velcro attached! 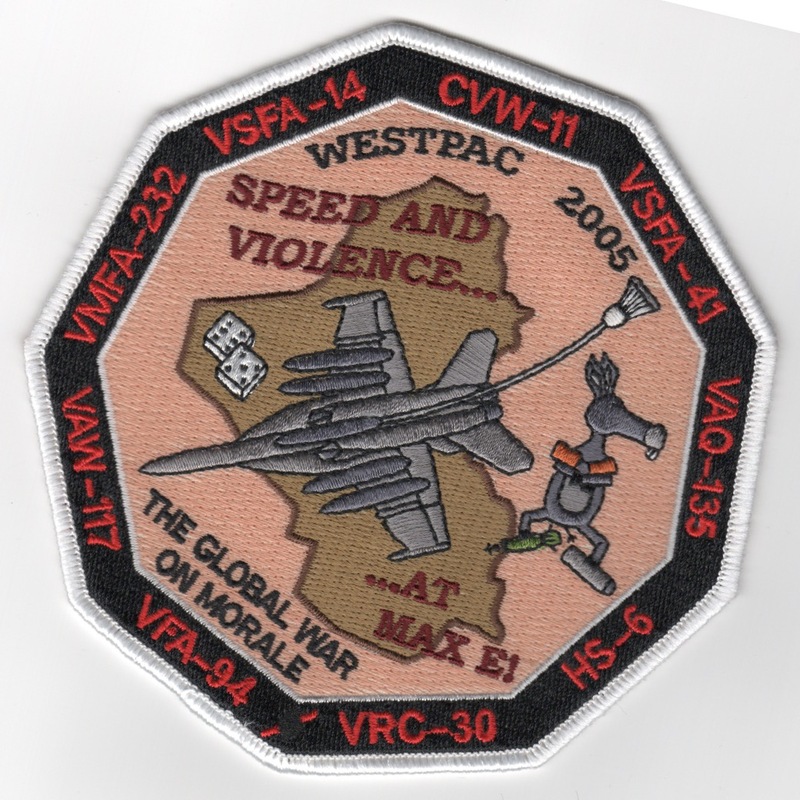 This is directly from the squadron: This is the 2005 WESTPAC cruise patch that says "SPEED AND VIOLENCE" at the top and "THE GLOBAL WAR ON MORALE" along the bottom. It lists the Airwing (CVW-11) and all the squadrons along the border, but note that it says "VSFA" on two of them due to them having to tank the other aircraft.......it is in a 9-Sided design, one side for each "unit". This patch does not have velcro attached. Homepage | Order VFA-41 Patches!